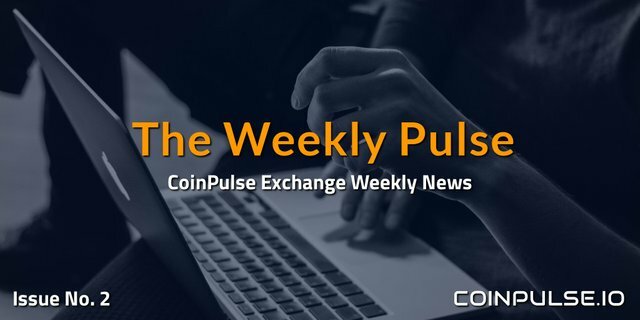 Welcome to the second issue of the CoinPulse Weekly Pulse, where you can find the all the latest CoinPulse news and updates! A lot has happened this past week at CoinPulse! The new UI release has been a great success! With this release, we had only a few minor adjustments, so it is evident that our devs have been perfecting the CoinPulse Platform on a consistent basis. We wanted to bring you the best, and the positive comments from the community reflect the excellent work completed by our development team. We are delighted to announce that CoinPulse has begun the new Swap Competition and 100% Match Giveaway. 5 winners will share the prize and everyone who participates in the BTC/CPEX swap will receive a 100% match Bonus for a limited time only! Competition prize pool: 10% of amounts raised during the swap program to be paid in BTC. The prize pool will be equally divided among the Top 5 users that used our swap page to make the purchases and will be distributed two weeks after the end of the program. Both the competition and swap program will end on November 15, 2018 23.59 UTC. Example — if CoinPulse raised 100BTC through swap, then the prize pool will be 10BTC, which will be divided equally among the top 5 users. If you are in the top 5, then you will receive 2BTC for free. 100% Match Giveaway: After the competition is over, each user that participated in the BTC/CPEX swap on our swap page will also get a 100% match for the CPEX tokens purchased to be distributed in CPEX tokens. In other words, if you bought 100,000 CPEX during the swap period, then you will receive additional 100,000 CPEX free at the end of the program. · To qualify for this competition and giveaway your total volume on the swap page must exceed 10,000 CPEX. · Maximum 10 million CPEX available under this program. Once we reach our cap, the program and competition will be closed. · Giveaway rewards will be issued within two weeks from the time competition ends. · CoinPulse Exchange reserves the right to cancel or amend the competition or its rules with prior notice. Remember, the competition starts every Friday at 06:00 AM UTC, and will last for 7 days until the following Friday, 05:59 AM UTC. The goal of this contest is to increase the much-needed volume for CoinPulse which can qualify us for listing on CMC. The second week of the competition is already underway, but there is still plenty of time to compete. We are expecting more entrants each week, so get in before the competition gets intense! Remember, this will be an on-going weekly competition until further notice. We are proud to announce the first installment of CoinPulse University! Join CoinPulse Team Member, Justin Chains, as he gives an in-depth commentary, walking you through our recently launched User Interface. Moving forward the CoinPulse University Series will feature short instructional videos on specific aspects of the exchange, like placing orders, cancelling orders, strategy in placing limit orders along with a lot more. So, stay tuned for many more instructional yet always entertaining videos from Justin and CPU! Don’t forget to hit the like button and subscribe to our YouTube channel! CoinPulse in the News, Integrations and Listings! We are very pleased to announce that OmiseGO (OMG) token is now available for trading and withdrawal on CoinPulse Exchange. OmiseGO aims to be the next generation financial network and decentralized economy. They have a very active community and a skilled ambitious development team. CoinPulse is currently working on integrating SpectreCoin (XSPEC). SpectreCoin is developing an energy-efficient “proof-of-stake” algorithm that will enable anonymous staking. The CoinPulse team is also gearing up to add many more new listings. Stayed tuned for more announcements very soon! CoinPulse Exchange and the CPEX Token are both on the Blockfolio App. You can now include your trades when using CoinPulse and follow price fluctuations for CPEX in your portfolio. Please be advised that in order to have this functionality on the Blockfolio App, you will need to make sure you have upgraded to the Blockfolio 2.0 version or later. What you mean to us! · Highly secured. Matched with Coinbase. · Lowest fees. Pay only 0.06% with discount. · No bots. All real traders. · Quality Assets. We list assets only after thorough research. · Already on Delta App, Cryptocompare.com, livecoinwatch.com, coinpaprika.com, Blockfolio, and many more! · No fake volume or pumps and dumps. · New CoinPulse University, where we go in-depth on a variety of subjects to help you learn how to use the CoinPulse Exchange to the fullest and get the most out of it. Now that we followed through with our promise, we want to bring CoinPulse to the world. We need you to tell the world about us. If you like using CoinPulse, please tell your friends. Let other crypto traders know about us. Share! If you feel you have positive and informative comments about us, write about it! Let the world know about us! We don’t use any bots and don’t have any fake pumps. Your trading on the exchange will help build the seed volume that we need to really get going! When we say we are a community supported exchange, we mean this in every sense; it takes every one of you to build the CoinPulse community. We appreciate each of you, and are proud of our community. We look forward to building our future with you hand in hand. Please see the announcements page on CoinPulse for more information on subjects discussed in this article.